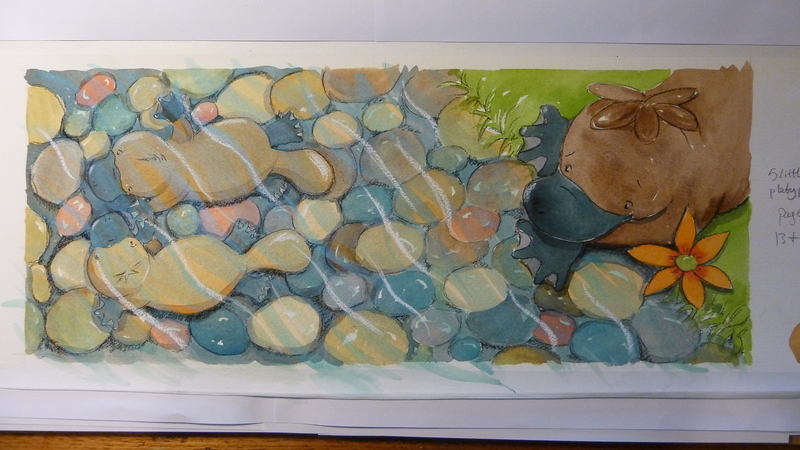 Nearly two years ago I was asked to do a little sample sketch of some platypuses for a possible book. I did this. Then I forgot about it. Months later and after I’d completed a couple of other books they came back to me with the platypus idea. They evolved and grew and changed feet and characters. I have just completed the end papers and now I am waiting for the book to arrive. But it takes ages. I love that though. Just as you’ve forgotten all about ever doing the work and you’re well into the next project some shiny new books arrive. I particularly want to see these though. Back to spiders and another interesting project which is very worthwhile but confronting.